I don’t know if I drew the short straw in my family early on in my life, but I became the person that ended up with the chicken breast. People generally prefer to eat the chicken thigh as it has more flavour and remains succulent while it cooks, and in my family that’s definitely the case. I found that when there was a whole chicken on the table, everyone would fight over the other parts of the chicken while I could reach for the breast without a struggle. No one wanted the chicken breast so I would eat it and I gained a reputation for it. Often my family would automatically pile up the chicken breast into my bowl as if they were doing me a favour whenever we had chicken. I didn’t mind this as I was growing up because I didn’t really know better, chicken was chicken to me. But now that I’m older and I’ve learnt how to cook, I have developed an appreciation for and prefer the chicken thigh more. My family still thinks that I love chicken breast though and I am fine with that, and happy to take up the breast for the team when we eat chicken together. I feel like it’s my responsibility to because this is how it has been all my life. Maybe this has something to do with the fact that I am the oldest of three children in my family and throughout my life I’ve learnt to look after everyone else first, the art of compromise and I have sacrificed a lot of things for my younger brother and sister (like my freedom growing up in a strict Asian household so that they could have theirs, as my parents became less strict on my younger siblings). My dad is worse off though because he gets the arse, neck and scraps of meat on the boney bits which no one else can be bothered with, my mum gets the wings because she enjoys and deserves them, my younger brother gets the drumsticks (treasured Asian son) and my younger sister gets the thighs (spoilt youngest child). I eat most of the chicken breast in my family and end up consuming more chicken in total than anyone else. I would console myself by saying that the breast is less fatty than the thigh so I can eat more chicken and not feel guilty about it. Well this is the excuse that I would try to use on my younger sister to get her to eat some chicken breast with me but she declines. She obviously knows what’s good for her. So who else as a result of certain circumstances ended up being known for eating a particular type of food in their family? Did you end up with the chicken breast too? 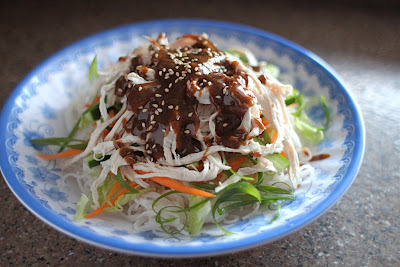 I was inspired to try cooking Bang Bang Chicken after reading about it in #10 of Feast magazine. 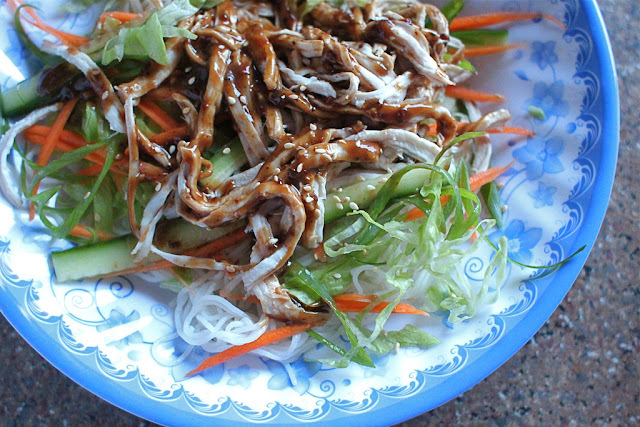 Bang Bang Chicken is a street vendor's dish from the Sichuan region of China. The name of the dish is derived from the fact that you pound the chicken *bang* *bang* to loosen the fibres of the chicken, making it easier to tear into shreds. 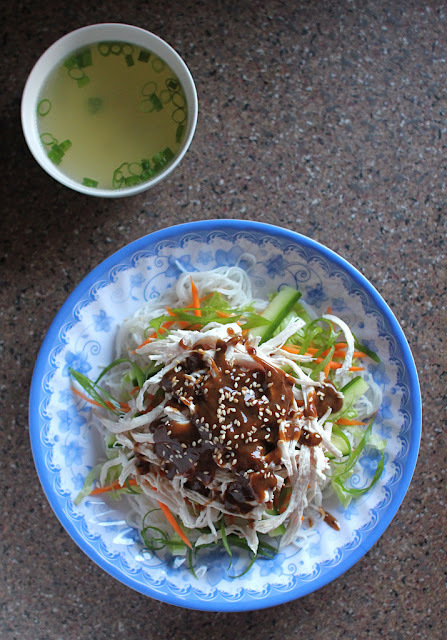 As this was a Sichuan dish I consulted my Sichuan cooking bible – Fuchsia Dunlop’s Sichuan Cookery and ended up cooking a dish that adapted both these recipes and I served it with rice vermicelli noodles. Most recipes for Bang Bang Chicken specify the use of the chicken breast. So if you are not particularly fond of chicken breast, this is a good way to enjoy it as the chicken is has been tenderized by all the banging and has a flavoursome chilli sesame sauce drizzled over the top. This is a Sichuan dish, so it needs to be hot, do not skim back on the chilli oil and Sichuan peppercorns. What I love about this dish is the hot and numbing sensation you get as you eat it, which is contrasted with the different textures of the cool vegetables and rice vermicelli. While the recipe called for the chicken to just be cooked in water, I decided to cook the chicken in chicken stock with some Shaoxing wine, coriander, spring onions, black peppercorns and ginger to give it more flavour. Then I used the leftover stock to make a simple soup. 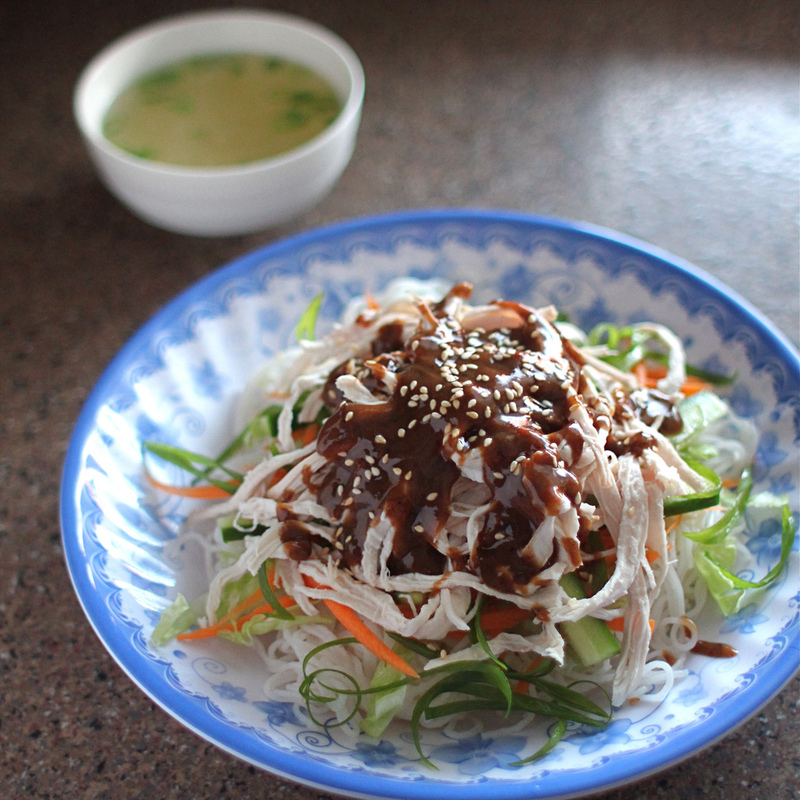 When you order something like Hanianese Chicken Rice at a restaurant it is generally accompanied with a bowl of soup. It’s nothing fancy but a simple clear chicken broth with chopped spring onion floating on top. To me, it’s an essential part of the meal, it feels comforting to drink and it helps to wash the meal down. 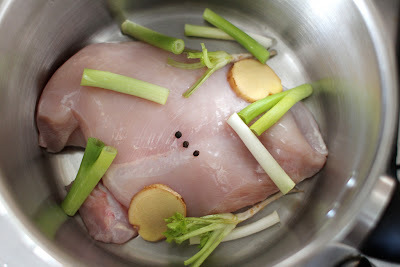 Place chicken in a medium sized saucepan. 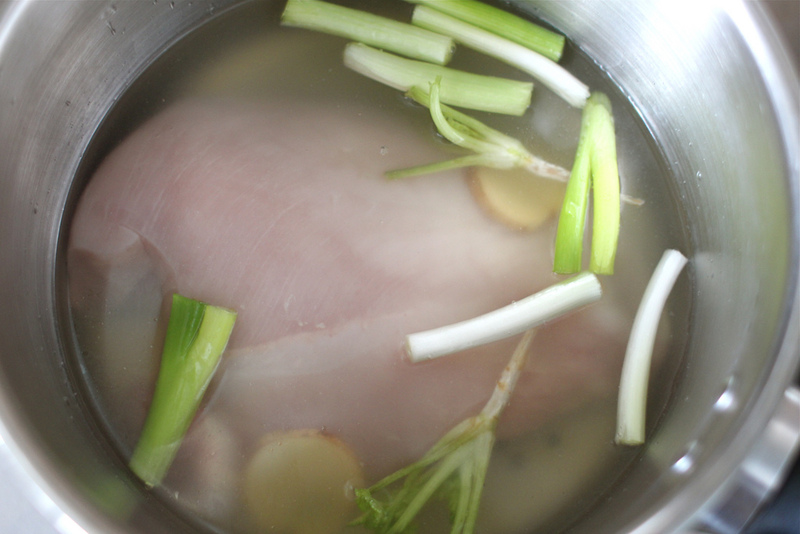 Add ginger, coriander root/stems, spring onions, black peppercorns, Shaoxing wine and enough stock to cover. Bring to boil and simmer for 2 minutes, then remove from the heat and stand for 20 minutes or until the chicken is cooked through. Strain the chicken and let cool (reserve the stock). 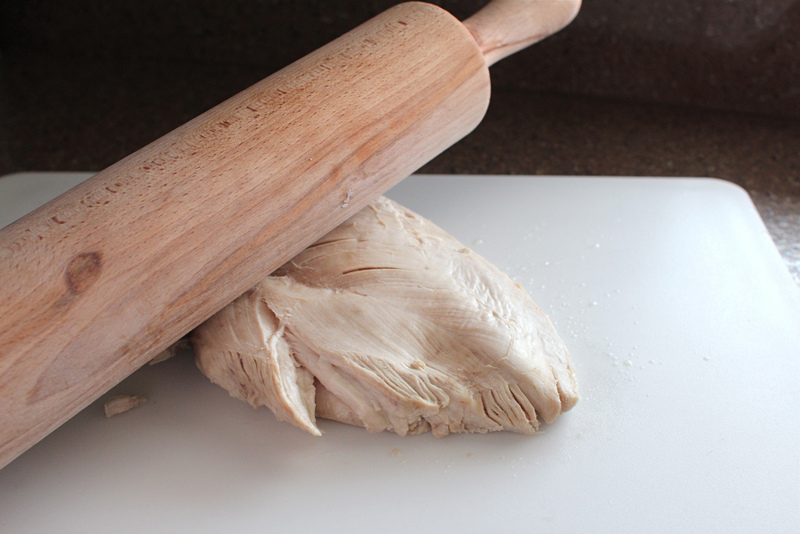 Place the chicken on a board and use a rolling pin to hit the chicken a few times *bang* *bang* to loosen the fibres, then shred the chicken with your fingers. Cut the cucumber in half lengthwise and discard the seeds. Slice into thin strips, then place in a colander, sprinkle the pieces lightly with salt and let stand for at least 30 minutes. Drain and gently squeeze out the excess moisture. Set aside. 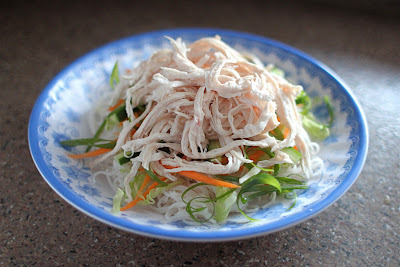 Cook rice vermicelli according to packet instructions. Set aside to cool. 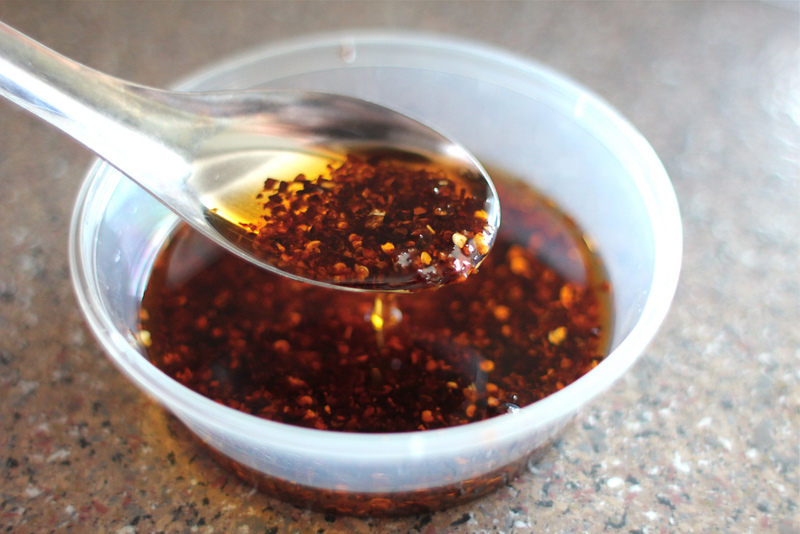 To make the chilli sesame sauce, toast the Sichuan peppercorns in a frying pan over low heat until fragrant, take care not to let them burn. Using a mortar and pestle, grind to a powder. In a bowl, whisk together the sugar, salt, light soy sauce and black vinegar until the sugar dissolves. 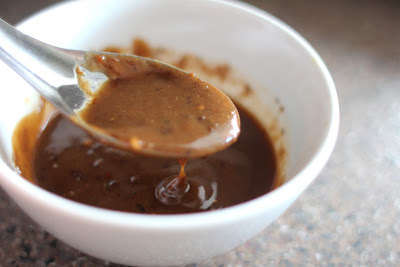 Gradually stir in the sesame paste to make a smooth sauce. Add in the chilli oil, sesame oil and Sichuan pepper, and mix well. 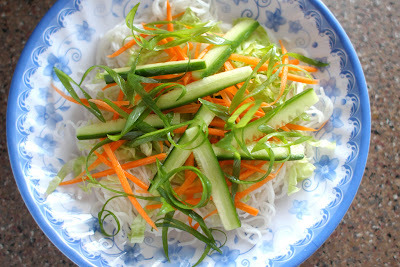 To serve – place the vermicelli on a plate/bowl and add on lettuce, carrot, cucumber and spring onions. Top with shredded chicken and drizzle on the chilli sesame sauce. Sprinkle with toasted sesame seeds. To make a light chicken broth – strain the stock that the chicken was cooked in into a saucepan and bring to boil. Season the chicken stock to taste with a little light soy sauce, fish sauce, salt and white pepper. 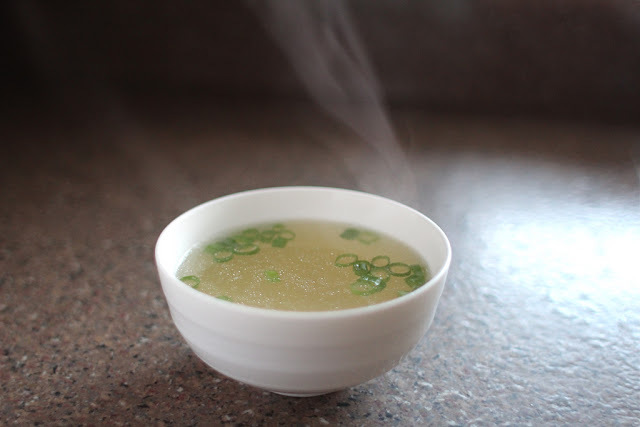 Spoon the soup into bowls and garnish with chopped spring onion. When I flick through my Vietnamese cookbooks, the dessert section will contain dishes like crème caramels, flans, custards and tarts. These dishes are associated with the French and were brought over to Vietnam during the French colonization (1874-1954). 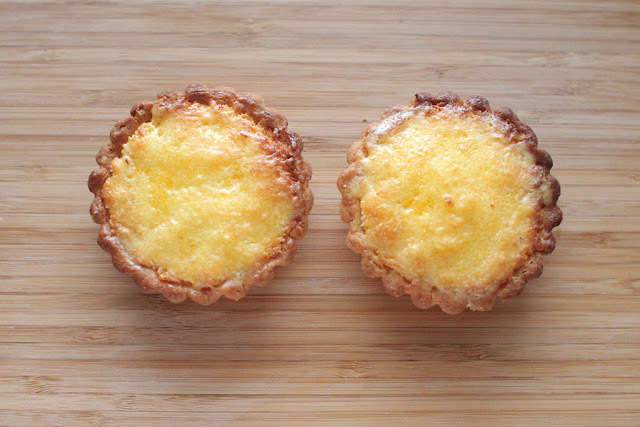 They are commonly eaten by the Vietnamese, so much so that they have made it their own with a Vietnamese twist using ingredients like coconuts, Vietnamese coffee, condensed milk and pastry often contains shortening rather than butter. When I was traveling around Vietnam last year, I found many bakeries selling French desserts and the range and quality available was amazing. It was always such a treat to get a box of sweets for just a few Australian dollars. My friends and I would often wonder down to the local bakery after dinner to get dessert and bring it back to our hostel and unwind from the day’s travel by watching whatever was on MTV (Gaga, Katy Perry on repeat) or the movie channel (I think I saw the same Jennifer Lopez movie three times, the one where she gets pregnant). I generally don’t watch much TV but my consumption of junk TV seems to skyrocket when I’m on holiday, but it’s more background noise as my friends and I plan the travel adventures for the next day and we bond over taking the piss out of how unrealistic everything that we watch on TV is. 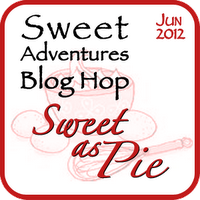 This month’s Sweet Adventures Blog Hop is hosted by fellow Perth food blogger, The Kitchen Crusader and the theme is “Sweet as Pie” which can be basically anything with a pastry base such as a pie, tart or galette. 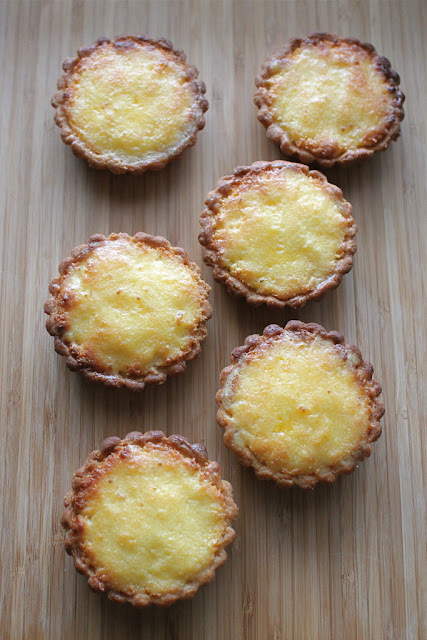 I decided to bake a French influenced Vietnamese dessert - Vietnamese coconut tartlets for this blog hop. You’ll find coconut used in a lot of Vietnamese dishes, especially in desserts. Coconut enriches and provides sweetness to desserts so you don’t need to add much sugar. Vietnam is one of the top ten coconut producers in the world as Southern Vietnam enjoys a tropical climate all year round which is ideal for growing coconuts. The Ben Tre Province located in the Mekong Delta has been nicknamed by the “Land of Coconuts” as it’s the biggest province cultivating coconuts in Vietnam and contributes to half of the country’s coconut yield. To make the Vietnamese coconut tarts I adapted a recipe from The Foods of Vietnam by Nicole Routhier. The recipe states that it yields six 3-inch tartlets. I doubled the quantity of ingredients for the pastry dough and ended up with 8 tartlets, maybe I used too much dough to line each tartlet but I was happy with the thickness of the resulting tartlet cases. I found that only one quantity of the coconut mixture which I added a bit more double cream into was needed to fill all 8 tartlets. 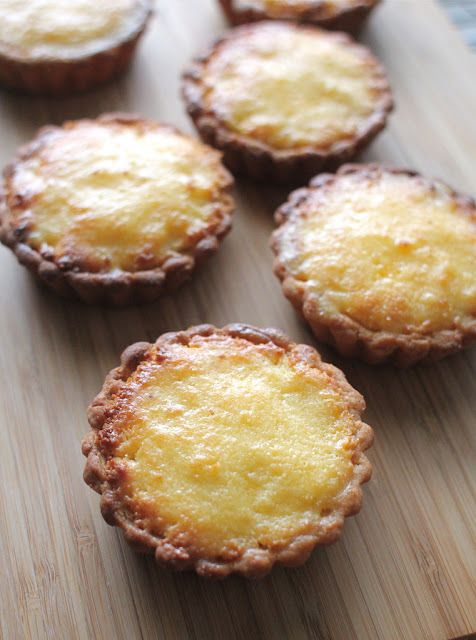 I used a mix of shortening and butter in the pastry, and also added in a bit of milk powder. I have a big tin a of milk powder at home which I first bought to make Momofuku’s crack pie and I am slowly using it up by putting a tablespoon here and there in all my baked goods for a bit of a flavour boost. Christina Tosi, the mastermind behind all the Momofuku Milk Bar Store treats uses a lot of milk powder in her baked goods to give them an interesting depth of flavour and refers to milk powder as the MSG for baked goods. 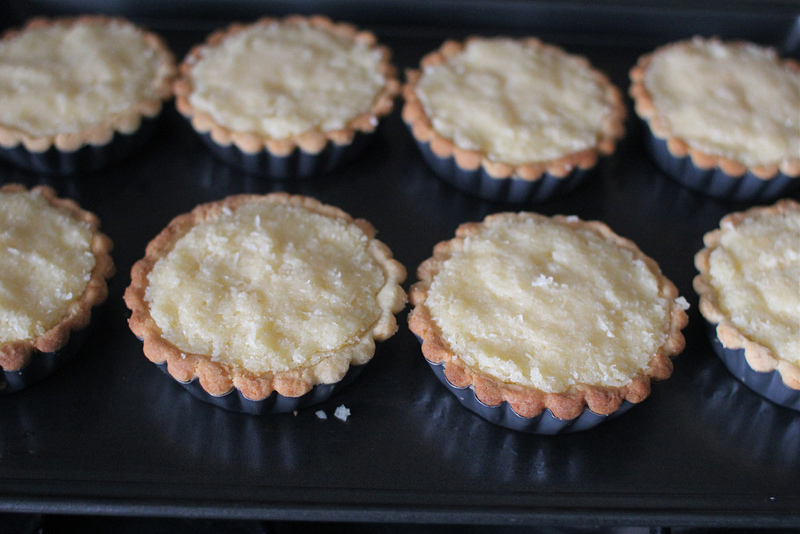 I also blind baked the pastry shells before filling them with the coconut mixture. Routhier’s recipe does not require the pastry to be blind baked. The pastry of the Vietnamese coconut tartlet is crumbly while the coconut filling is soft and flaky. 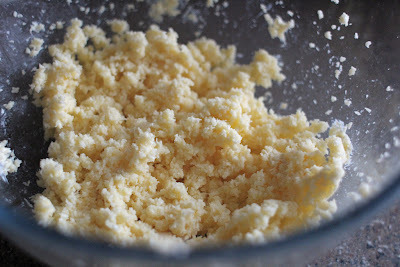 To make the pastry In a bowl, beat the shortening, butter and sugar until fluffy. Stir in the egg yolks and vanilla, mix to combine. Add flour, baking powder and milk powder, and mix well. Turn the pastry out onto a lightly floured surface and gently knead until it comes together into a dough and is smooth. 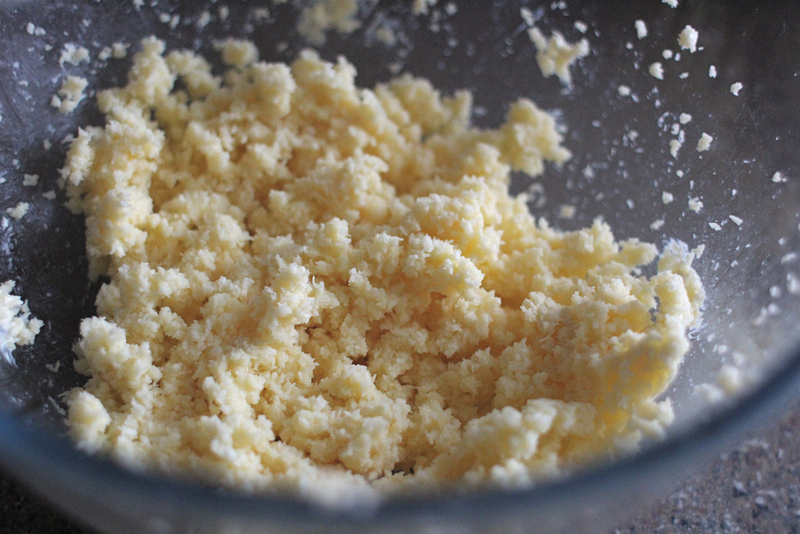 Press the dough into tartlet pans, prick the bases and refrigerate for 30 minutes. To make the filling In a bowl, combine the coconut, sugar and butter together. Add egg yolk, double cream and vanilla. Blend well with hands to form a soft paste. Preheat oven to 180C. 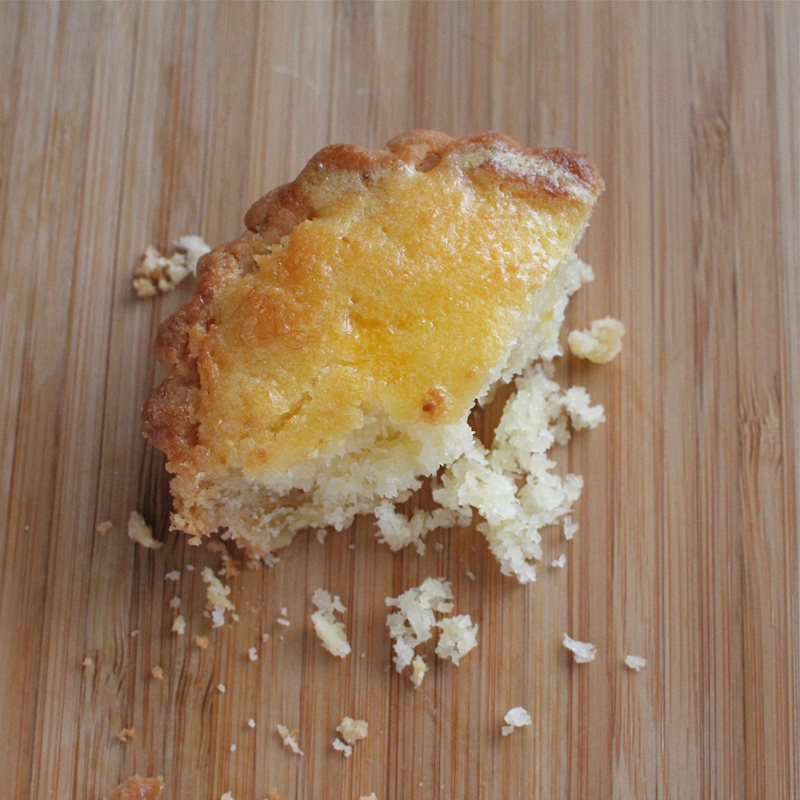 Take the tartlets out of the refrigerator and blind bake them. 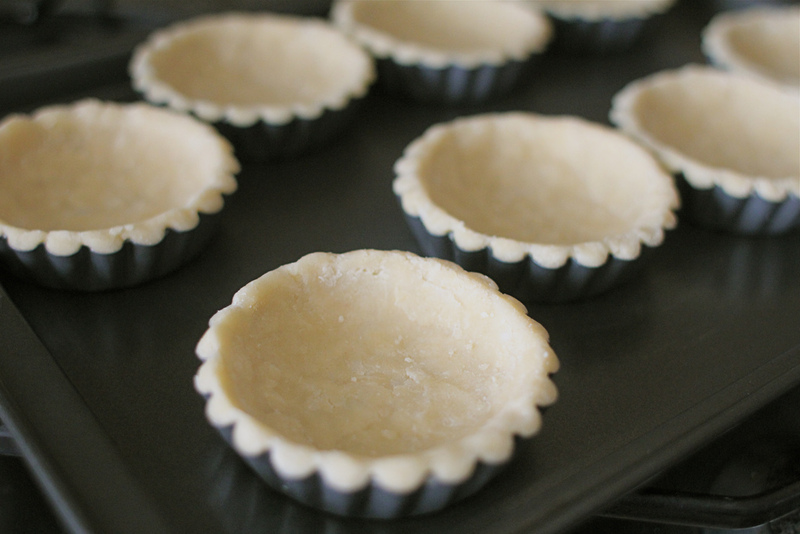 Line the tarts with baking paper and fill with baking weights. 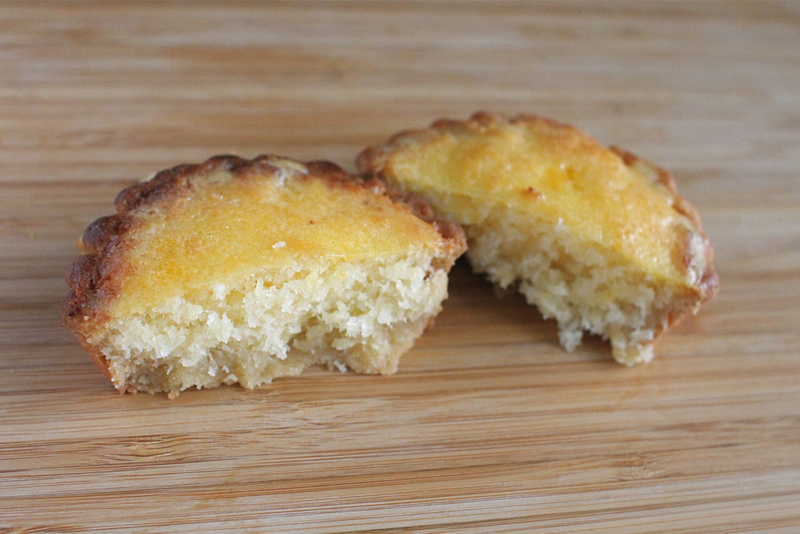 Place the tartlets on a baking tray and bake for 10 minutes. Take the tartlets out of the oven and fill them with the coconut mixture, smooth the top. 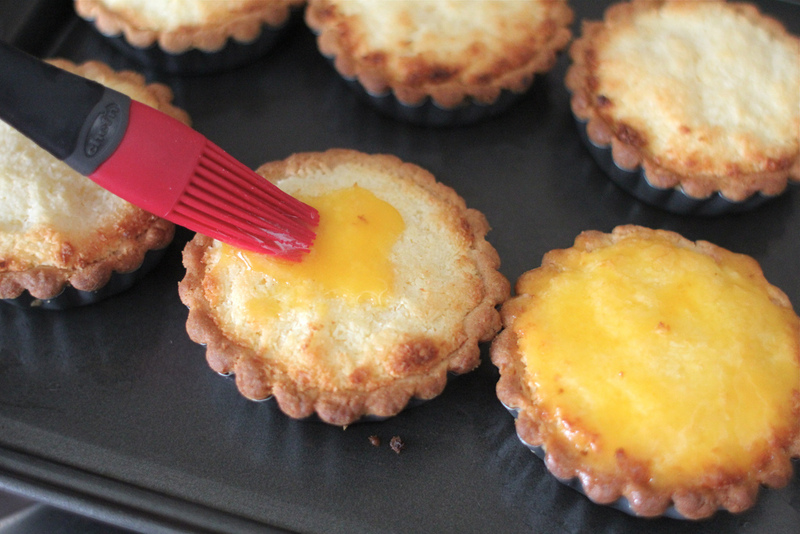 Bake the tartlets for 10 minutes. While the tartlets are baking, make the glaze – in a small bowl beat the egg yolk slightly and stir in the melted butter. After 10 minutes, take the tartlets out of the oven and brush the surface and the crust edges of the tartlets with the glaze. Return to the oven and bake for another 5 minutes.